Fans of Venom know the love between Eddie Brock and the symbiote has always been hard to define. But in the newest comics, Marvel has confirmed that Eddie isn’t just completely devoted to his alien symbiote… he’s painfully jealous of the love it still feel for its ex-boyfriend. In all honesty, referring to the host of the Venom symbiote as a “boyfriend” would be selling that connection short, since the true blending of identities that defines the Venom symbiote goes much, much deeper than affection. Those who saw the Venom movie know Eddie and the symbiote’s love was obvious enough to raise eyebrows among the uninitiated, but in the comics, that line was left behind long ago. Now, Marvel is taking it one step further, acknowledging that Eddie is heartbroken to know that his symbiote is still not over its last host, the super-soldier Flash Thompson. 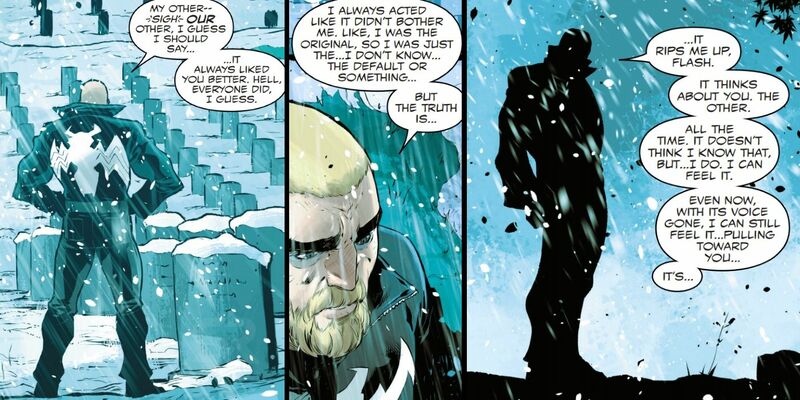 As the Eddie Brock fans surround him with loving support and proclaim that “he’s so much better a partner than Flash Thompson,” the truth is a bit harder to swallow. Because when comparing the heroic attributes of both men who have held the title “Venom,” it’s hard to dispute that Flash Thompson is the greater paragon. Serving his country in the armed forces, losing his legs in combat, and returning to bond with the symbiote to keep on defending his nation? It’s no wonder that Spider-Man calls Flash his hero. It turns out that as helpful as it may be for two beings to share the same body and mind, it also means that keeping secrets is easier said than done. In the case of Venom, it means Eddie Brock must sense his symbiote’s lasting love for Flash Thompson. But credit to writer Donny Cates and artist Iban Coello for rendering the scene in terms that almost anyone can understand, as Eddie and Flash may be talking about a former lover of one, and returned partner to the other. The fact that Eddie can’t actually blame his symbiote for enjoying being Flash’s ‘other half’ just makes it all the harder to watch him accept that while he can’t stand to live with the symbiote… he knows he’ll always be its second choice. 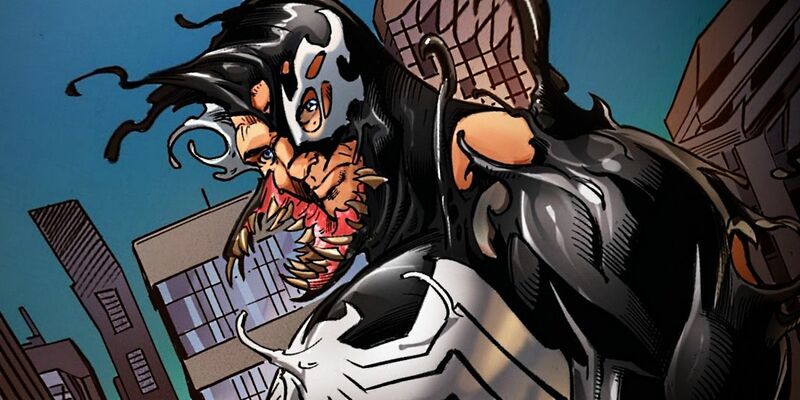 Fans may have never stopped and wondered which of its hosts was the symbiote’s ‘favorite,’ or if Eddie shared the opinion that his greatest claim to the symbiote and ‘Venom’ name was simply being its first. But now they have those answers. At least until the symbiote offers up its own opinion. Here’s hoping that Eddie is just being hard on himself, because let’s be honest: the best person for us isn’t always the one we find irresistible. Chin up, Eddie. Venom #8 will be released on November 14th from Marvel Comics.